Welcome to the first in our series of interviews with the organizers behind Death Salon. Each subject was interviewed by a fellow organizer or event coordinator. Here you will learn more about each participant’s contributions to the Salon, their own fascinating body of work and more about Death Salon itself. Elizabeth Harper is an LA-based theatrical designer, mapper of relics, armchair hagiographer, and the blogger behind All the Saints You Should Know. 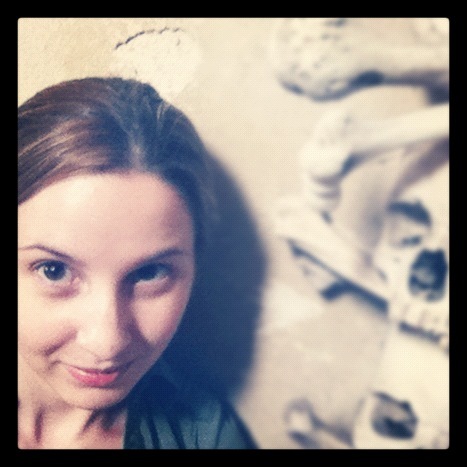 She also writes about relics for Atlas Obscura and tweets at @CadaverFormosus. She is being interviewed by Bess Lovejoy. Tell me about All the Saints You Should Know. For those who aren’t familiar, what’s the focus? And how did the project come about? Were you raised Catholic? When did you first develop an interest in relics? What thoughts have you developed about why relics fascinate you? I was and I grew up in St. Louis, Missouri, where Catholicism is definitely the dominant religion. In St. Louis it’s not so much a matter of if you had a concrete statue of the Virgin Mary in your front yard, but if you preferred painted or unpainted concrete. Plus I was always sort of Wednesday-Adams-ish as a kid. Before I learned about relics I was sustaining my interest in religion class with lepers, martyrs, and the gory details of crucifixion. I also loved the art. There were all of these incredible mosaics at the Basilica as well as paintings, icons, stained glass, and wood-working. Every surface and prop was beautiful. So when our parish priest, Father Don, brought a liver relic in this incredible gold reliquary to church it was instantly my new favorite thing. As an adult, I love how their bones and even their most insignificant possessions—like the bloody gym sock of Padre Pio—become part of the stories of the saints. Along with their hagiography, personal diaries, letters, and iconography in every medium, it gives us an incredibly complex and detailed yet still mysterious portrait of their lives. What portion of Death Salon are you participating in? I’m really excited to be part of Morbid Anatomy day with Joanna Ebenstein, founder of Morbid Anatomy, and Colin Dickey, author of Afterlives of the Saints: Stories from the Ends of Faith. My particular contribution is actually about female saints of the Middle Ages and extreme mortification of the flesh (which is physical self-punishment as penance). A lot of these young female saints’ behaviors are now what we would classify as self-harming or eating-disordered, maybe even personality-disordered. 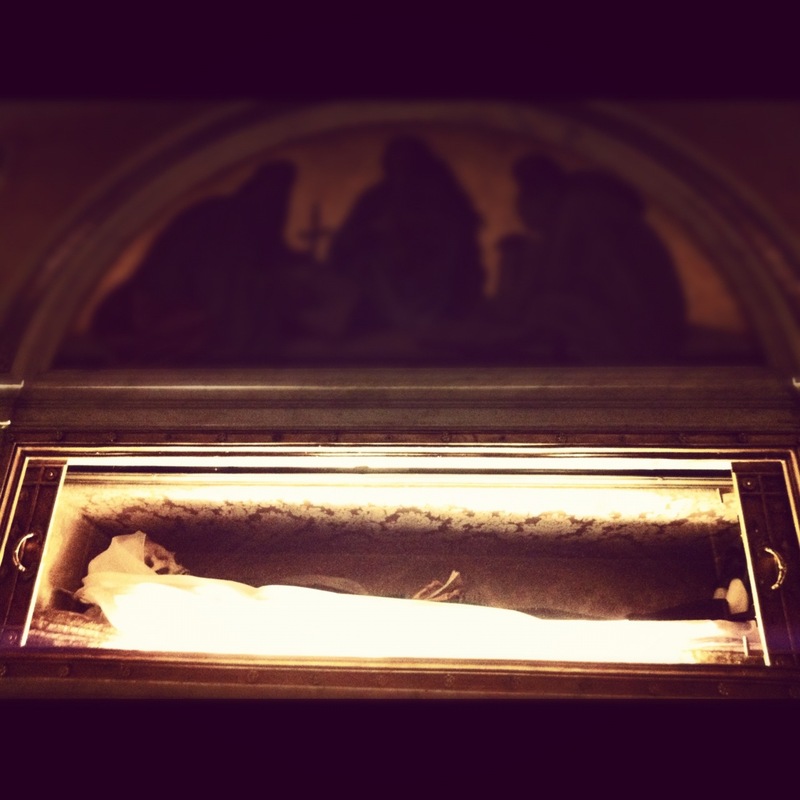 I recently wrote a three part essay about it after seeing the skeleton of St. Francesca Romana in Rome. She fasted to the point where it became a form of anorexia and she brutally mutilated her body with nails and hot animal fat. There’s something deeply sad and immediate about this aspect of her life and those like her and the urges that drove all of these holy women to do this. What are you looking forward to about the conference? I can’t wait for the Uncommon Corpse cabaret. There are going to be some awesome speakers (like you!) and I love Jill Tracy’s music. Any other projects you want to share with us? I’m working on a completely insane map of every publicly accessible relic in Rome. There are over nine hundred churches within the city walls so locating all of these relics, let alone documenting which saints they belong to, is pretty daunting. You would be shocked to know how many churches have random skulls sitting in reliquaries but no one can tell you who they belong to. We should be keeping tabs on this sort of thing, right? I mean, I guess I am. Bess Lovejoy is a writer, researcher, and editor based in Seattle. She writes about death and the dead, forgotten history, and sometimes art, literature, and science. Her writing has appeared in The New York Times, The Wall Street Journal, Time.com, The Believer, The Boston Globe, The Stranger, and other publications. She worked on the Schott’s Almanac series for five years. Her book Rest in Pieces: The Curious Fates of Famous Corpses is out now from Simon & Schuster.